It is an unusual sight. Along the coast of the North Cape, Prince Edward Island, these trees, known as krummholtz are usually found in subalpine and subarctic areas. This area is neither. The name comes from the German words krumm, which means crooked, bent or twisted and holtz, meaning wood. The unusual nature of the trees of the Black Marsh Trail on North Cape is obvious at the beginning of the trail. The sides of the trunks exposed to the elements are almost devoid of limbs. The exposed side experiences the tree equivalent of frostbite. The severe conditions on the Cape cause the trees to be be misshapen. The wind, salt sea spray, ice and cold stunt the growth of the trees and eventually kills them. Drought in the summer can have an effect as well. With time, the dead trees are works of art. Some sculptures show a flag-like appearance with the branches emanating from one side of the trunk. A bit further from the shore, the trees show the effect of the elements in a less dramatic way because of the trees in the background. You can imagine, as the shoreline erodes, these trees will be like the ones closer to the shoreline today. There is a flag krummholtz further from the shoreline as well. The affected trees are covered in lichen early on in their journey to artwork. Labels: krummholtz, North Cape, Prince Edward Island, weather conditions. Our walk along the coastal portion of the Black Marsh Trail of North Cape gives a view of the cliffs in the shadow of the wind turbines. The cliffs are ten to fifteen meters above sea level and red due to the coating of hematite, iron oxide, on the granules in the stone. The erosion of Appalachian Mountains is the source of this sandstone. 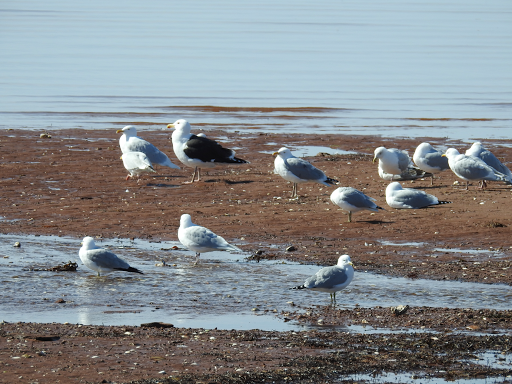 Water carried the sand, silt and rocks from the Appalachians into the Maritime Basin three hundred million years ago where it accumulated, hardened and became Prince Edward Island and parts of the other Atlantic provinces of Canada. The cliffs have a conglomerate of pebbles held together by natural cement, siltstone and the sandstone. This redbed, as it is known locally, is very susceptible to erosion. 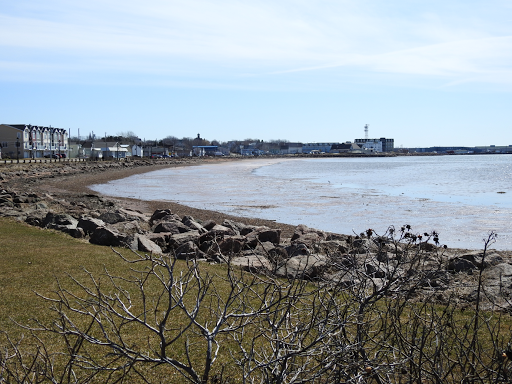 It is curious that erosion was part of the process which formed PEI and erosion is wearing it away again. Sea stacks are common around the island and there is one visible along the trail. Called Elephant Rock, we see it in the distance as we walk along the coastline. Erosion has changed it too. After the winter, fencing along the top of the cliffs is hanging over the edge in two locations. 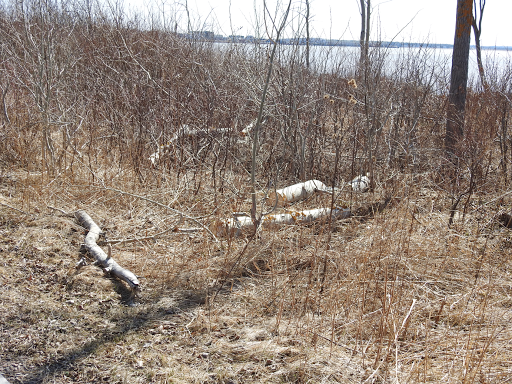 The trail has been redirected in several places already. Work will have to be done on the trail before tourist season begins, so we are careful where we step today. a road goes down to the shoreline. 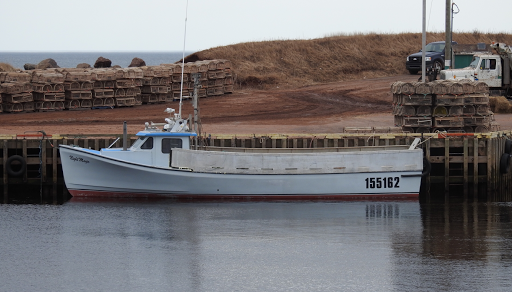 Irish moss harvesters will access the shoreline to collect the red algae for carrageenan, used commercially for its gelling and thickening properties. The road needs some repairs as well. We do not venture there today. It is cold today, unlike our visit to the Cape two days previously. We dressed for the weather however and even had a picnic, warming ourselves with the hot tea. We planned our next adventure as we watched the birds gliding on the breeze. 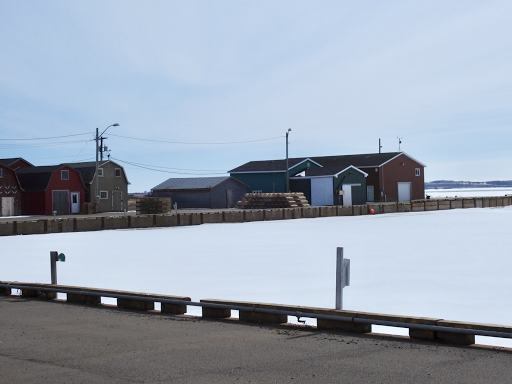 It was a glorious spring morning as my husband and I headed for a walk along the boardwalk by the bay in Summerside, Prince Edward Island. While it was cold, the air was still, as confirmed by the reflection on the water. 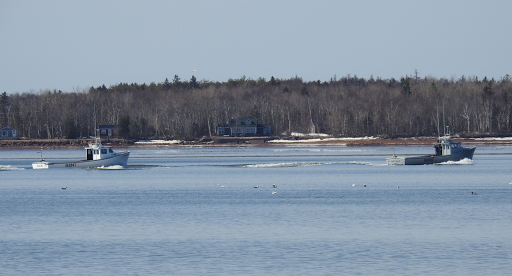 Off shore, two boats headed out the bay, the first boats we've seen this year since the harbour thawed. They were a welcome sight. 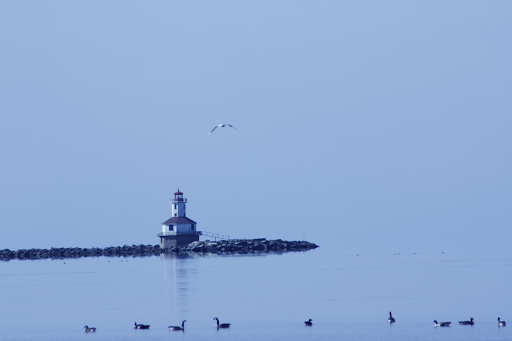 Looking out the bay towards Indian Head Lighthouse, the sea and sky blended into one. 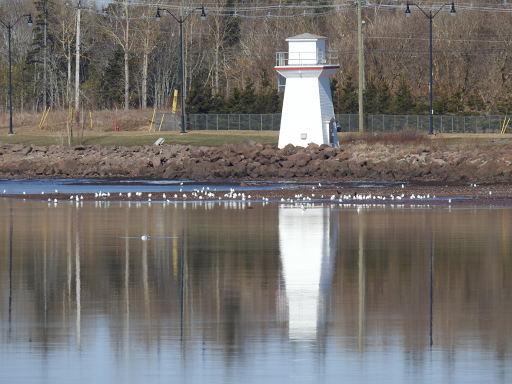 The gulls were noisy, that gull sound which signals salt water, a familiar sound of home. 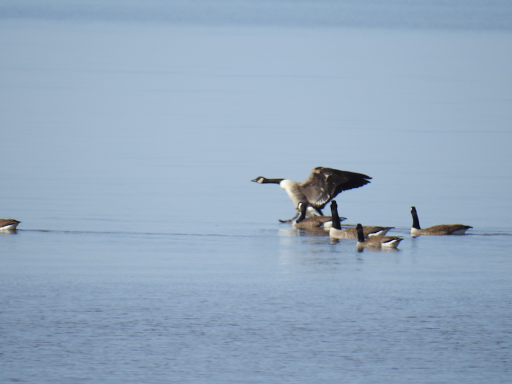 Geese swam nearby and one commanded the attention of the others as she landed. 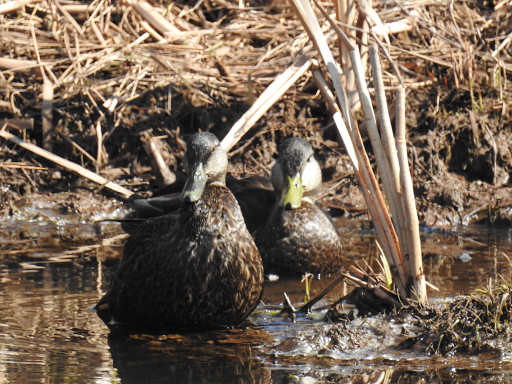 Two American black ducks swam around one of the streams which empties into the harbour. The hen and drake have large bills and round heads and stayed close together in their little stream. 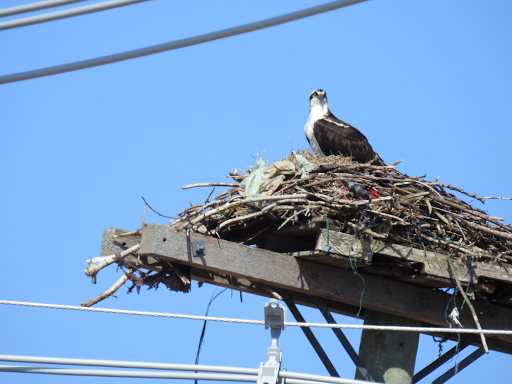 Further along the boardwalk, an osprey sat on a nest atop a pole. He was scanning the area, watching the cars and walkers pass below him. This bird, a fish eater, nests in an ideal location, by the harbour and the streams which feed into it. This was the first time we had ever seen a bird in this nest which has been in place for years. 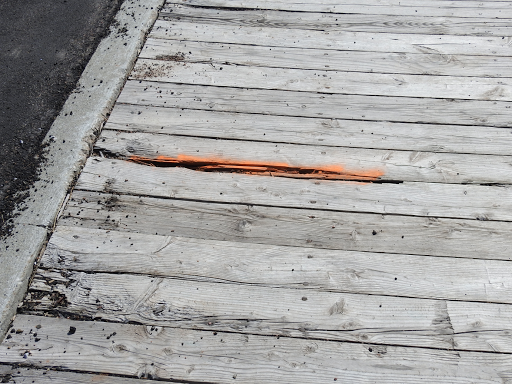 The city is repairing the boardwalk and area this week. Along the boardwalk itself, any boards which need to be replaced are marked with fluorescent paint to alert walkers and mark them for replacement. The trees and limbs which were damaged are being cut and residents are free to take the wood. 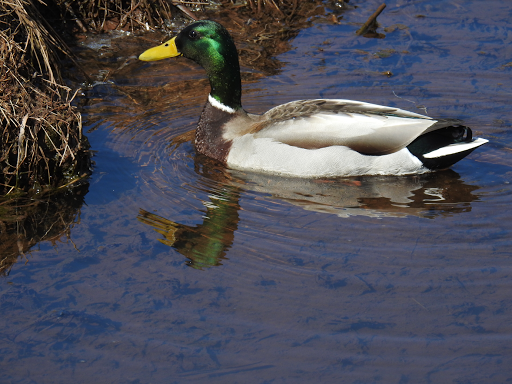 From the bridge where we usually stop, only a mallard drake is swimming today. Where is the hen? Will we see ducklings soon? 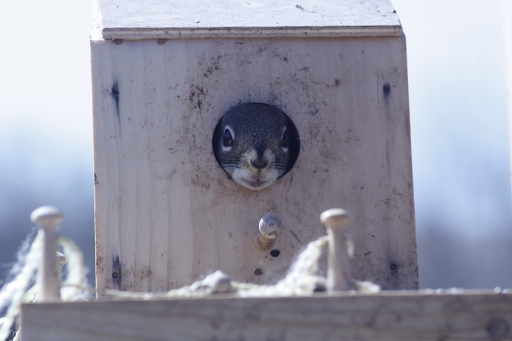 As many times as we have seen the squirrels, they always manage to charm us. This little one looked to be smiling at us! 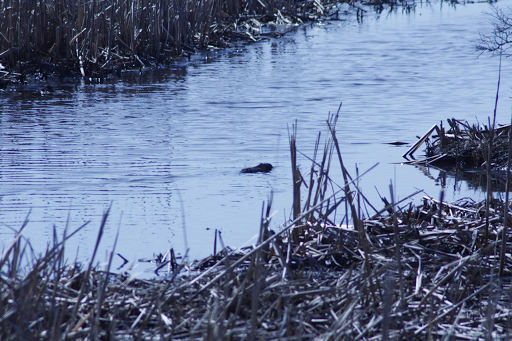 We saw the beaver but could only get one photo before he dived again. However, he looks like a log in the water. We fear we will not get a good photo of him before the city moves him out of the area because of the flooding he causes. 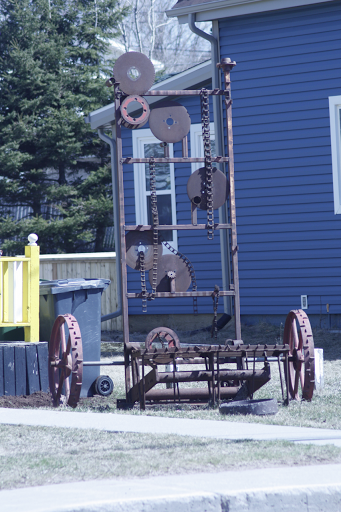 On our return, we saw artwork on a lawn across the street from the boardwalk. When you have scraps, why not use them in a creative way? It is a great addition to the area and a great place to finish to our walk. 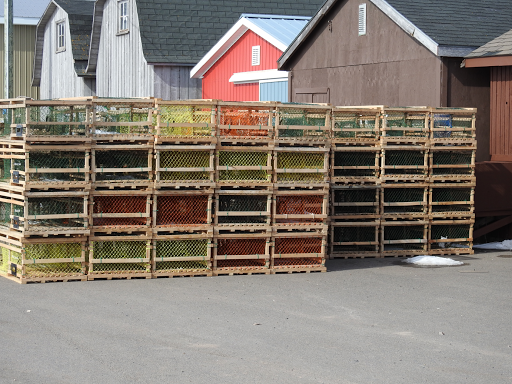 Two weeks ago, in Malpeque and Darnley Basin on the north shore of Prince Edward Island, lobster traps were everywhere. The season was more than a month away. 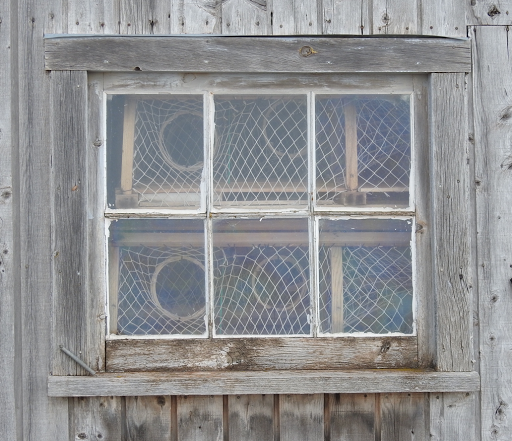 The fishing shacks were full of traps. Wharfs were piled high too. 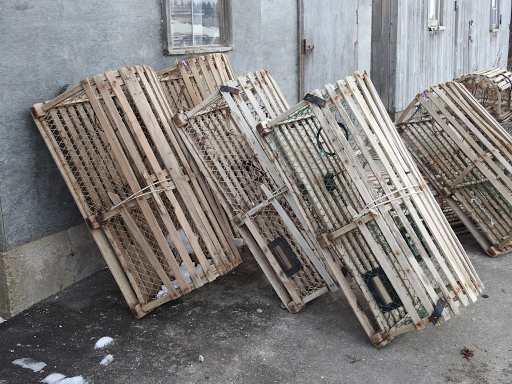 Some traps rested against the shacks. The basin was ice covered. 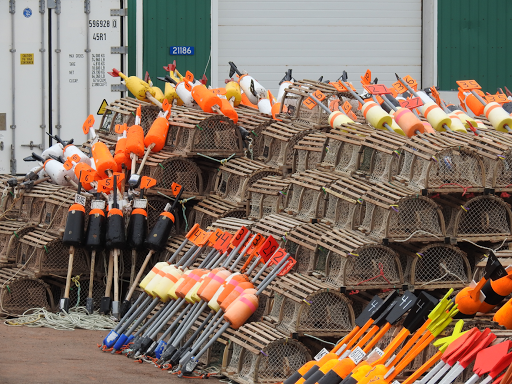 Last week, at Lot 1 on the north west tip of the island, the scene was different, as preparation for the season has ramped up. 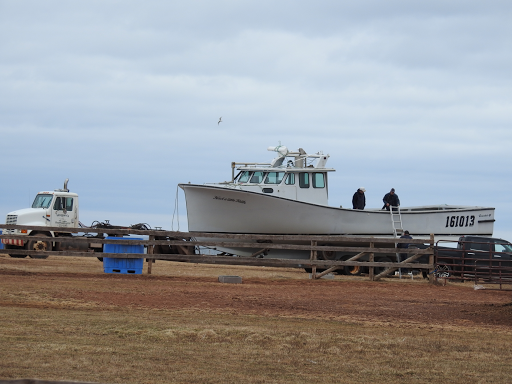 Several boats, high and dry since last fall, were being pulled to the sea. 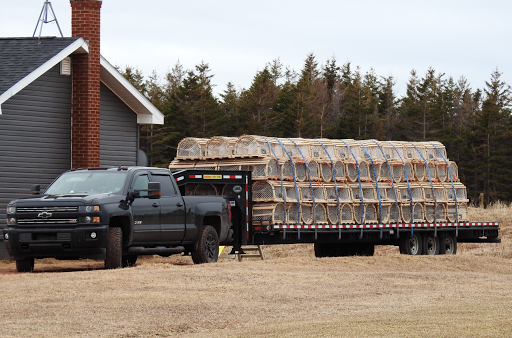 Flat bed trailers loaded with lobster traps were on their way to the wharf. 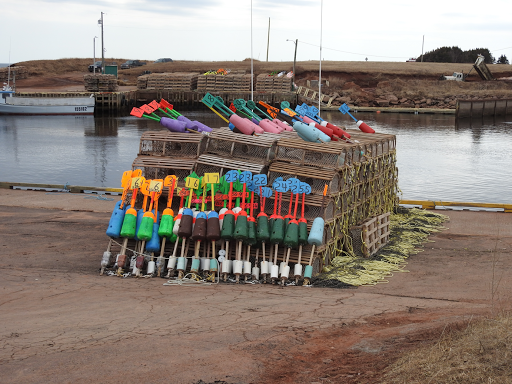 Meanwhile, on the wharf around Seacow Pond Harbour, some traps were ready for the season. 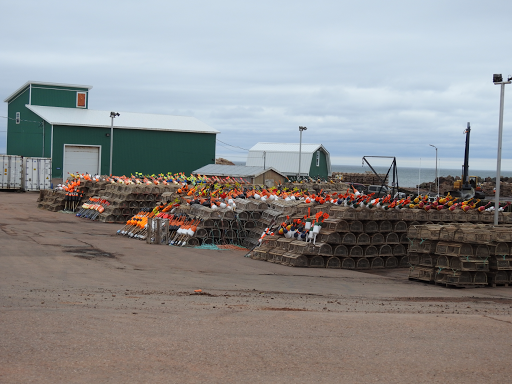 The colours of the buoys, visible from the road, prompted us to stop and take in the scene. 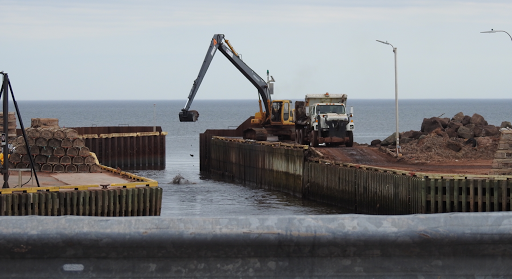 Dredging at the entrance to the harbour will ensure safe passage of the boats for the season. The first boats were back in the water. Preparation is well under way now.